Seeking Health Niacin is a mono-preparation in the composition of which there is vitamin B3 in the form of nicotinic acid. The supplement is in the form of comfortable, tasty, cherry lozenges. It contains no artificial colorings, aromas or sugar. It is recommended to complement vitamin B3 deficiency, which may appear as a result of malnutrition or following a diet poor in basic sources of this vitamin. Vitamin B3 is a name, which is used in relation to two chemical compounds - nicotinic acid (niacin) and amide of nicotinic acid (nicotinamide). Vitamin B3 also is sometimes called vitamin PP due to its anti-pellagric activity. 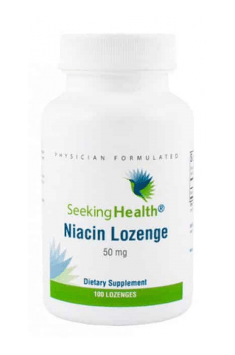 Niacin is incredibly important for the proper functioning of the organism; it takes part in many biochemical reactions, activates a range of important enzymes, is an important component of key coenzymes. It influences the nervous system, regulates the work of the hormonal system and influences cardiovascular system. It facilitates the process of detoxification, improves condition of skin and hair. Vitamin B3 is soluble in water. It is hard to overdose, as it is not stored in the organism and its excess is quickly excreted with urine. Interestingly, the human organism is able to synthesize niacin endogenously. However, these amounts are insufficient to fully cover the needs of the organism. Additionally, this process takes place with the participation of tryptophan and a few other B-group vitamins. Deficiency of any of these substances will result in impairing niacin production. When it comes to external sources, the largest amounts of vitamin B3 can be found in meat, legumes and green vegetables. Vitamin B3 has positive influence on the circulatory system and works well in the prophylaxis of cardiovascular diseases. It decreases the risk of developing atherosclerosis, protects from stroke, heart attack and coronary artery disease. It is very helpful in regulating lipid profile. It increases the positive cholesterol fraction (HDL) and facilitates reduction of the problematic LDL fraction. It works through inhibiting lipolysis, which automatically decreases the production of free fatty acids, out of which very low density lipoproteins are produced. They are a precursor of the so-called “bad” cholesterol (LDL). Additionally, niacin limits the synthesis of triglycerides, which in excess are harmful to health. Vitamin B3 supports the work of the nervous system and is conducive to the improvement of mental well-being. In order to understand this mechanism, we need to mention tryptophan and serotonin. Serotonin, also called the “happiness hormone” is commonly associated with good mood. It is produced in the transformations taking place with the participation of tryptophan. Tryptophan is used in the organism for niacin production. If the organism does not receive a proper amount of niacin from external sources, it will use tryptophan for the synthesis of niacin. Serotonin production will suffer in this process, which will entail lower mood, increase of anxiety and sleeplessness. In the course of research it was also proven that properly large therapeutic doses of niacin intensify the activity of gamma-aminobutyric acid (GABA), which soothes the nervous system, mitigates nervousness and increases mental comfort. Niacin may have large influence on metabolic transformations taking place in the organism. It is a component of two coenzymes (NAD and NADP), which play the function of electron carriers and control transformations of proteins, fats and carbohydrates. Thanks to this, it is possible to extract energy from food delivered to the organism. Impairing this process as a result of vitamin B3 deficiency may result in weakness and lack of energy. Vitamin B3 is helpful in detoxifying the organism. It accelerates elimination of heavy metals, decreases harmfulness of some drugs and increases the pace of alcohol metabolism. One of the basic properties of niacin is the ability to widen blood vessels, which entails the increase of blood flow. It contributes to faster and more efficient elimination of toxins from cells. Vitamin B3 may free from tension headaches and alleviate the symptoms of migraine. Scientists proved that persistent migraine symptoms (visual impairment, severe headache) occur as a result of vasoconstriction in the trigeminal nerve. Niacin causes widening of intracranial vessels, and thanks to this it decreases strong headaches. Vitamin B3 may be used for improving skin condition. It is conducive to the fight with acne vulgaris and acne rosacea, increases skin blood supply and stimulates epidermis renewal. It may also improve the condition of follicles, prevent excessive hair loss and eliminate dandruff. To sum up, Seeking Health Niacin is a very good way to complement potential deficiencies of vitamin B3. It is worth remembering that they concern people who follow a bad diet or often drink alcohol. Supplementation may also be considered in case of recurring migraines. Take 1 lozenge as directed by your healthcare practitioner. Lozenge may be broken into smaller pieces if lower dosage is desired. The supplement contains the proper dose of vitamin B3. Lozenges should be kept in mount until they dissolve. If the need arises, the dose may be divided into smaller parts. Niacin should not be supplemented on an empty stomach due to the occurrence of possibly unpleasant symptoms related to sudden widening of blood vessels. They are called “niacin flush” and give symptoms of skin redness, stinging and tingling. They subside after 30 minutes. Taking the supplement with a meal decreases the risk of this type of problems. Xylitol, ascorbyl palmitate, malic acid, natural cherry flavor, and silica. Natural flavor derived from cherry.